Now that the weather is cooler, the days are shorter, and the sun slants into my kitchen at such a sharp angle that I'm sure autumn has finally arrived, I'm beginning to crave the hearty, earthiness of mushrooms. My family loves sautéed mushrooms, and frequently there's a competition between my children as to who can eat the most (Eve wins!). Last week I came across some particularly beautiful Criminis, which deserved their place in the spotlight. I took our favourite recipe for mushrooms, simmered with thyme and garlic in white wine, and folded it into a creamy risotto. Do I have to tell you that we were one happy family that evening? By now you know how much I enjoy making risotto. Do you remember this Roasted Beet and Chicken Sausage Risotto which I shared this spring? Never has there been a cooking technique that is more relaxing or comforting than stirring a pot of risotto. When I'm stressed, this is the dish I go to. Dare I even say that I sometimes make risotto solely for the purpose of calming my frayed nerves. The repetition of stirring the smooth, creamy rice around and around is a sure way of relieving tension. Enjoying it with dinner is a happy consequence. I make an endless variety of risottos, each one slightly different and unique. Risotto is an infinitely versatile dish and can hold its own as a side to a hearty roast, or can be the star of your table. The only necessary ingredients are good quality arborio rice, stock, a cup of wine (half for the pot and half for you), and some good background music - the rest is up to you. I frequently pair mine with organic sausage links, as sausage is easy to prepare with little supervision or effort. It can be left on the back burner to simmer and brown while you relax with your glass of wine to the methodical rhythm of your spoon against the bottom of the pot. I'll be honest with you. This Crimini Risotto does take a little more busy work than some of my other risottos. In fact, I used every burner on my stove to prepare this dish, though the two back burners were used only to keep the sausage and broth warm. Don't worry, it's not as difficult as it sounds. Especially if you've prepped your ingredients beforehand. Chicken stock will work fine in this recipe; however, if you can get your hands on some organic mushroom broth it raises the risotto to the next level. Mushroom lovers everywhere rejoice! This is the risotto for you. To prepare the risotto, heat the oil in a large, deep skillet over medium heat. In a separate pot, heat the broth until it just simmers. Add onions and a pinch of salt and pepper to the oil. Sweat until just soft, about five minutes. Stir in the rice and cook until the grains become slightly transparent, stirring constantly (about 3 minutes). Add the wine and cook, stirring constantly, until all the liquid has been absorbed. Add a ladleful of broth and cook, stirring frequently, until the liquid is absorbed. Add another ladle of broth and continue cooking and stirring, adding more broth when the pan becomes dry, until you've incorporated all of the broth. Taste the rice, it should be creamy and soft, but not mush. If it is still a little underdone, add a splash of water and continue cooking. While the risotto cooks, prepare the mushrooms. Heat the oil in a medium skillet until hot. 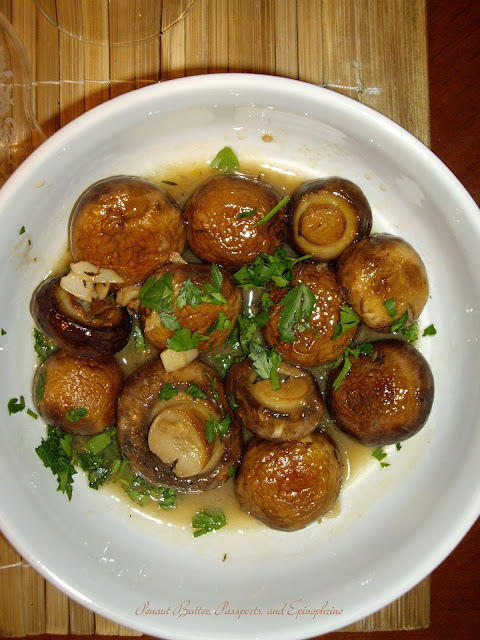 Add the mushrooms and salt, and cook without stirring for several minutes until the mushrooms begin to caramelize. Turn the mushrooms to caramelize on the other side. When the mushrooms are brown, add the garlic and thyme and cook for just a minute. Add the wine and lemon juice and bring to a simmer. Simmer until the liquid has reduced by half. Stir in the butter, turn off heat, and adjust the seasoning. When the risotto is done, pour it into a large serving bowl. Fold in the hot mushrooms and their juice. 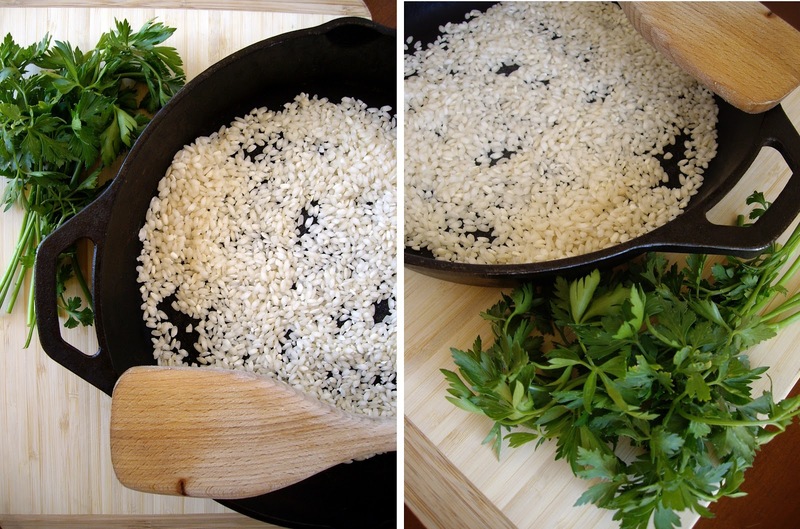 Garnish with a handful of chopped, flat leaf parsley. 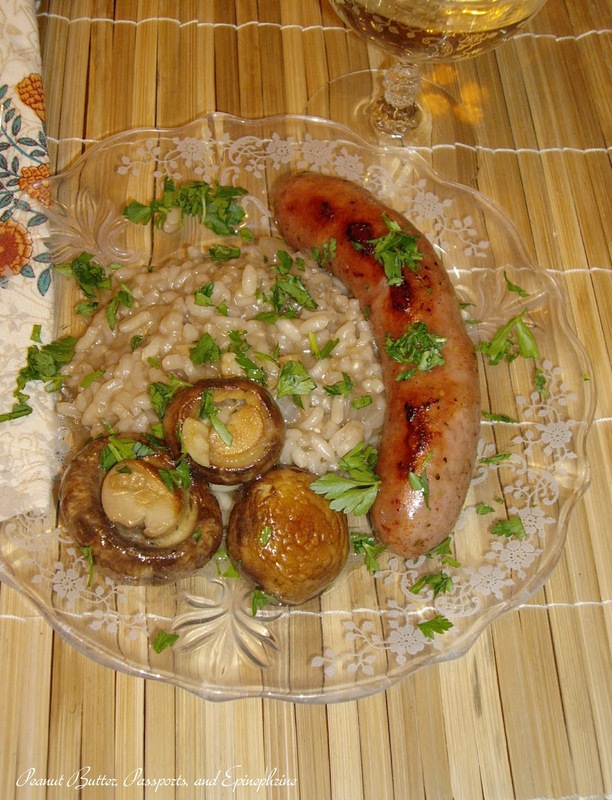 Serve as a main course or alongside sweet Italian sausage.